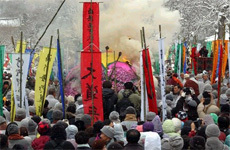 Ten of thousands of people attend a funeral ceremony for Ven. Seo-ong held at Baekyangsa Temple Dec. 19, 2003. Braving a flurry of year-end snow, thousands of Buddhist monks and tens of thousands of lay believers gathered in a remote Baekyangsa Buddhist Temple in Bukha-myon, Jangsung-gun, South Jeonnam Province Dec. 19, 2003. They were attending a special cremation ceremony called "dabi-shik(茶毘式)" for Ven. Seo-ong(西翁), the 5th patriarch (chief abbot) of Chogye Order, who died on Dec. 13, 2003 at the age of 92 while he was sitting against a wall, referred to by the Buddhist term "Juwatalipmang(坐脫立亡). Late Ven. Seo-ong still sits at "gyogabuja(結跏趺坐) position even after his death. "Juwatalipmang" means discarding the body while being seated and entering Nirvana. Only highly principled and noble monks can enter Nirvana in the way. "Dabi-shik(茶毘式)" means cremation ceremony for Buddhist monks. Rev. Seo-ong's mentor, Manam(曼庵) died in "Juwatalipmang," as well some 40 years earlier. This is a first in the history of Korean Buddhism in that both mentor and disciple died in "Juwatalipmang." 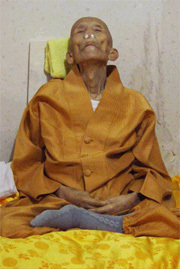 According to other monks who served the aged monk, Seo-ong preached to them for 30 minutes before his death. After the last sermon he said "It is time to go," going straight into his room and entering into Nirvana while seated. He died with his head a little over in "gyogabuja(結跏趺坐) position, which means sitting with his leg folded over the other as in Buddhist statue. He was wearing a brown robe. Seo-ong also left a Nirvana song or poem to his students right before his death." The poem says "Once a white crane is born, quiet is a millenium, and a breeze sends away evening glow at sunset." Ven. Seo-ong's coffin goes up in flames at the cremation ceremony held at Baekyangsa Temple Dec. 19, 2004. At around 1:30 p.m. Seo-ong's body was encased in a regular hexahedral coffin and was burned on the Yonwha-dae(蓮花臺), lotus flower table. 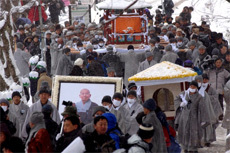 His followers kept chanting Buddhist sutra in unison while Seo-ong's body was reduced to ashes. Large flakes of snow continued to fall. were Bobjon(法傳), the current chief abbot of Jogye Order, Bobjang(法長), executive director of administration of Jogye Order, and Hong Ki-sam, president of Dongguk University, and Kim Kyu-chil, president of BBS(Buddhism Broadcasting System). Also present were top politicians and government officials including Choe Byung-yul, chairman of opposition Grand National Party, Cho Soon-hyung, chariman of Millenium Democratic Party, and Lee Tae-il co-chairman of ruling Wooree Party, and Oh Jee-chul, vice minister of Cuture and Tourism. Some 2,500 Buddhist monks and 30,000 lay believers attended the funeral ceremony in the temple. 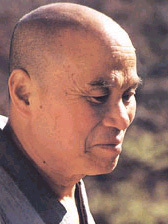 Seo-ong was recognized as the most famous Seon(Zen) master comparable to Ven. Songchol(性哲) who passed away in 1993. Songchol served as the 7th patriarch (chief abbot) of the Chogye Order. Seo-ong was known to teach his method of Ganhwaseon(看話禪) to his students one by one even when he was over 90 years of age. Born in Nonsan in South Choongchong Province in 1912 at the height of Japanese occupation of Korea, Seo-ong lost both parents when he was only seven. He grew up at the hands of his grandfather. As a teenager Seo-ong indulged himself in reading various books on Buddhism while he was attending Yangjong High School. It was at that time he made up his mind to become a Buddhist priest. Seo-ong studied at Yangjong High School. After graduation he left home to enter into the world of Buddhism at Baekyangsa Temple where he practiced under Rev. Manam. In 1935 Seo-ong went through Choongang Buddhism College, the predecessor of Dongguk University. In 1941 he entered a college in the Japanese ancient city of Kyoto. Seo-ong returned home in 1945, one year before Korea was liberated from Japanese colonial rule(1910-45). Thereafter he concentrated on his training, visiting one temple after another where he was respected as the most senior priest. Seo-ong became enlightened in 1967 while he was watching a water current streaming under a stone bridge near Baekyangsa Temple. It took him 20 years of hard discipline to reach an enlightenment. His quest for truth in life went on. In 1974, he rose to Buddhism's highest position of the 5th patriarch of Chogye Order, the largest and most influential sect of Buddhism in Korea. Throughout his life he emphasized the importance of "becoming a true person," holding countless number of classes for that purpose. "Once a man overcomes earthly desire by finding a 'true person' quality intrinsic in oneself, all the conflicts and struggles will disappear from the world," Seo-ong always preached with a smile. He even smiled at the last moment of his life. 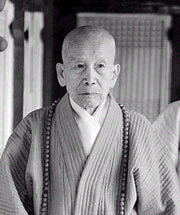 He picked Seon (Zen) meditation as the best method of practicing Buddhism. 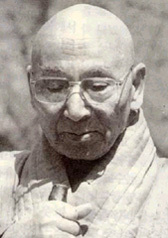 He authored many books on Seon and Buddhism. Thrifty by nature, he banned nearly all the fund-raising events in his Baekyangsa Temple, leaving it the poorest of all 25 head temples in Chogye Order. He practiced frugality throughout his life. Earlier in the year Ven. Soam (西庵), and Ven. Wolha (月下) passed away. They both served as patriarch (chief abbot) of Chogye Order. Seo-ong, Soam, and Wolha had one thing in common in that they all restored the tradition of Korea's Chogye Order Buddhism from Japanese-style Buddhism in which monks were allowed to marry. The three great masters also emphasized the time-honored tradition of Ganhwoseon(看話禪). Received during Japan's occupation of Korea from 1910 to 1945, Japanese Buddhism influenced Korean Buddhism very much. The result was that many Korean monks got married contrary to the tradition of celibacy. Five other senior monks have died within the past year alone.